Now that I've officially graduated with my interior design degree (woo hoo!) I'm going to be switching over fully to my website: stacygravesinteriors.com. I have imported this blog there, but I plan to only stick to posts relevant to the interior design side of things. In effort to consolidate, I've also put the option to purchase my prints directly from my new website, rather than having to go to Etsy. They'll still be available on Etsy as well, but I like the idea of having everything in one space. I also have a new product that I'll be launching soon, which I'll be announcing on Instagram and Twitter. I hope you'll continue join me over at Stacy Graves Interiors (where I'm still making lots of improvements!). I'll be posting next week about all of my recent e-designs and Quick Design Fixes, as well as our master bath remodel that we intend to start in the next month or so! You can also always catch these project updates on instagram, where I regularly post peeks into my projects and the world of Dallas design! Wow, I had been ahead of the game for most of the One Room Challenge, but reveal week definitely snuck up on me! It's almost finals week, and if you've been in school for interior design, you know it's full of a whole lot of all nighters. Between working on final projects, an open house presentation of my work, portfolio reviews, program interviews, volunteering, and Charlie being out of town this weekend I had absolutely no time to finish up and style our laundry room. I'm pretty bummed about it, but I figured I would still go ahead and show you the progress we've made over the last six weeks. You can read all about the transformation in these posts. 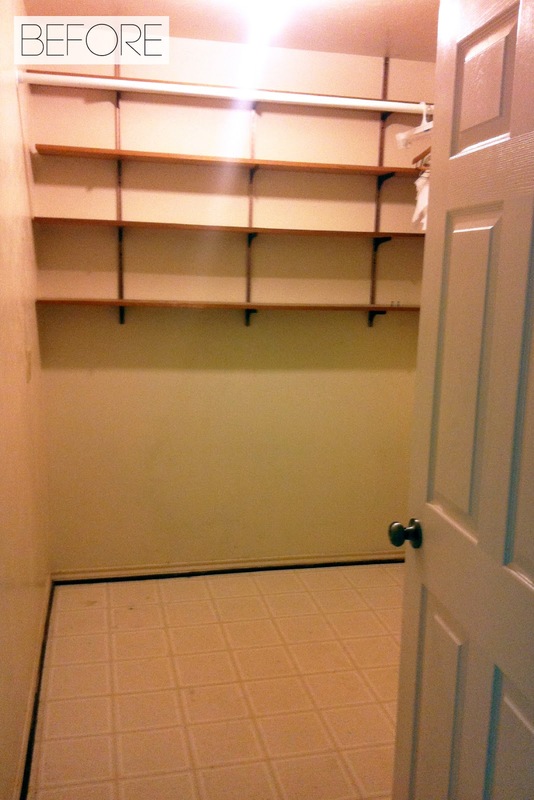 If you don't remember, this is what our laundry room looked like when we moved into our house. Here is what it looks like today! Even though it isn't quite complete and I wasn't able to get it styled, I'm still very happy with the progress we've made in just six short weeks. Unfortunately my baskets did not arrive in time, and I didn't have time before shooting to implement plan B, so the shelf is sitting empty for now. We used Ikea's new line of Sektion cabinets. These hang on a rail and don't sit completely flush against the wall which gave us a bit of a gap between the backsplash tile and cabinets. We have a small piece of trim to close the gap, it's just waiting for me to paint and install. I've also found some crown molding that will close the gap between the cabinets and ceiling to give the room a finished look. I want to give a big thank you to Linda from Calling it Home for hosting this challenge, and to everyone else for following along and leaving encouraging comments along the way! If I hadn't participated I'm sure our poor laundry room would have sat in its unfinished state for many more months. 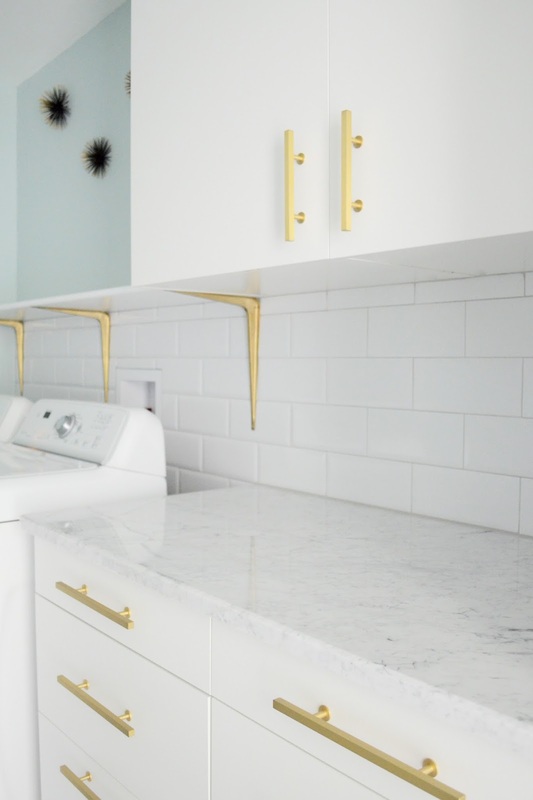 After my finals are over next week I'll get to work on the finishing touches, so keep an eye out on instagram for the final laundry room reveal, as well as other exciting remodeling projects we have planned for the summer! Don't forget to check out the 20 amazing transformations that were revealed on Wednesday, and the linking participants sharing their reveals today! one room challenge - final week! It's here! The week before the One Room Challenge reveal. So much progress was made this week, and it now looks like an actual room! If you need a reminder where we started with this project, you can check out these posts. This week I spray painted our old shelf brackets gold to go with our new hardware. This was an impromptu decision, and I'm so glad I did it! While we were tiling we realized we were going to have to bring forward our outlets and washing machine outlet box to accommodate the height of the tiles. We fixed the washing machine outlet ourselves, but we're going to bring in our electrician to fix the dryer outlet. We tried moving it ourselves, but it wasn't budging, and since 220V of electricity is nothing to mess with, we're going to let our electrician handle this one. Finally, when the new washing machine outlet box was installed, we had no intentions of tiling so it was set flush with the wall. In order to get the tile under the cover we would have had to rip out the drywall and reset the box. This would have been a lot of work, so we made the decision to tile around it and put some trim around the box to make it look more finished (we'll be installing this week). Drilling into our newly tiled wall to place our shelf was a bit nerve-racking, because short of ripping out the tile, there is no going back if you make a mistake! Thankfully we got it in with no problems. Also, this is bit of a side note, but if you haven't tried the limited edition peony scent from Mrs. Meyers you have to try it! I found mine at Target, but they can also be purchased through the Mrs. Meyers website. I'm so obsessed with the scent that I stocked up on enough to last me until next season! All of the accessories (except for the baskets) arrived this week and are waiting for their install! Finally, these brushed brass beauties will be used on all of the cabinets. We have these same handles in chrome in our kitchen, so after not finding anything else I liked, I decided on these to tie in with the rest of the house. Possibly install crown molding This is happening, but not before the reveal. We have other obligations this weekend and next week that will be preventing us from having time to install this. Install solar tube lighting for natural light. We have settled on a skylight, but installation will not happen before next week. I'm so excited about this, because getting natural light in here will completely change the space! New rug, art, baskets, and hooks The baskets may not make it in time for the reveal, but I have a plan B. Install trim piece around washing machine outlet box. Thank you for following along. Don't forget to check out the rest of the One Room Challenge participants! There is some serious talent this time around! Wow, I can't believe we're now only two weeks away from the One Room Challenge reveal! If this is your first time visiting, you can follow these links to catch up on week one, week two, and week three! This week there wasn't a lot of visual progress, but there was still a lot completed. 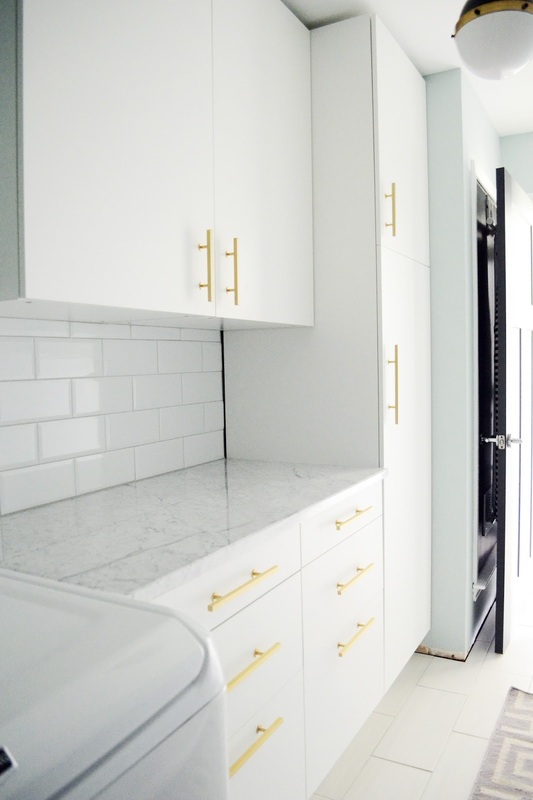 We changed our minds for the third time, but we have finalized our backsplash to this oversized beveled subway tile. We like this option better than the plain subway tile we had originally planned to use since it will bring some more texture into the space. This is going up this weekend once our countertops get installed. Speaking of countertops, after searching all over Dallas our fabricator was able to get this carrara marble remnant for us! They measured yesterday, and we're on the schedule for installation today! Here is a close up of the floor tile. It was very affordable, and I really love its linen texture. We used a warm gray grout that we will also be using on the subway tile backsplash. My Hicks pendant arrived this week and we'll be installing her this weekend! I also got our water heater closet door painted and properly vented. I debated about painting the vent the same color as the door, but I don't have a paint sprayer and I was worried it would look sloppy with a brush. I left it white because no one will ever see this door unless they're in the laundry room with the door shut (which will never happen). We're still waiting on the matching lever to arrive, so we have a temporary knob on here for now. Possibly install crown molding This might be back in the mix due to some adjustments - I need to make my mind up on this ASAP! Replace water heater closet door hardware - ordered! 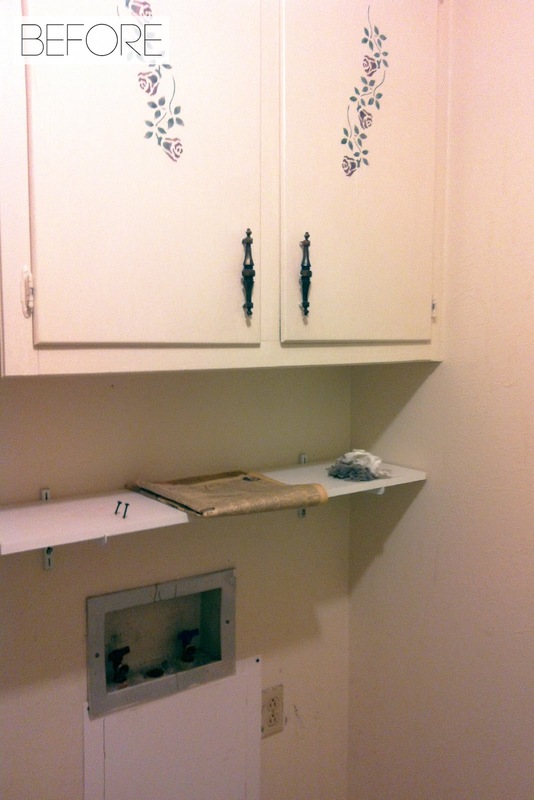 Install cabinetry hardware - ordered and on it's way! Install marble countertop - getting installed today! New rug, art, baskets, and hooks - All ordered and all on their way to me! By next week everything should be installed and ready to be photographed for the big reveal in two weeks! You can check out the rest of the linking participant's progress here. 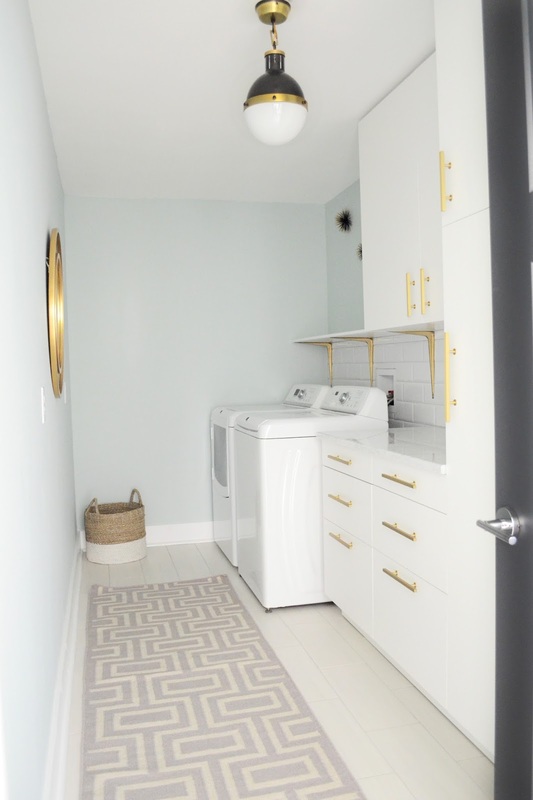 So, my laundry room design has already changed since yesterday's post! After doing some measuring I confirmed that the light fixture I had my eye on definitely wouldn't fit without moving the electrical. I went on an extensive search for something that wouldn't interfere with the cabinet door swing and just as I was ready to give up and convert to recessed lighting it hit me - the Visual Comfort Hicks Pendant! I have wanted to use this for years, but I never had the right place for it. The small pendant measures in at 8.5" wide, which is the exact measurement that we need! To solidify the deal, Horchow had them in stock and 30% off, so this baby is on its way to me! Since I splurged a little on the light fixture, I had to re-evaluate my art selection. The paintings I had originally chosen were on the small side, which meant I would need to buy two to make them work in our long room. 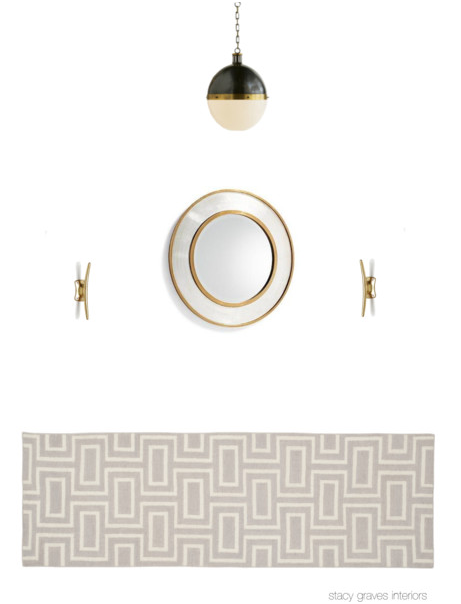 I found this round mirror for one of my recent e-design projects, and it's just the right size and style for this room. I lucked out and also scored this on major sale, so I officially have all of the accessories purchased and finalized. Now I'm starting to get excited to see it all come together!